In ConvertXtoDVD 5, you can now "stick" your subtitles directly into the video. This is the way to go if you want the best display quality for your subtitles. AND this is very useful for people who want to have the subs showing no matter what and don't want to have to activate them on the media player (if you watch the video on your PC) or with the DVD player remote control. Insert your video, click on it, it will activate the preview screen on the right. Click on the "Subtitles" tab underneath . If you have to insert subtitles "manually", do so now by clicking on the "folder" icon. Then click in "show advanced" in the window that opens. 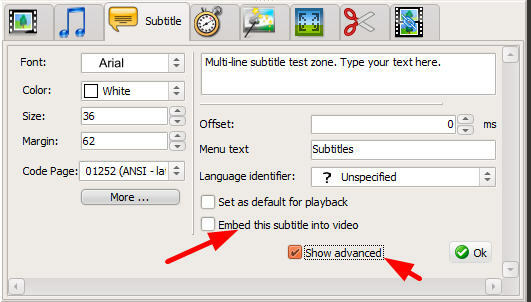 Simply tick the option "embed subtitles into the video"